What exactly does BlogsWriters.com provide? Can you write on any subject? What qualifies your blogs writers to do my project? What are you blog writing rates? Can you reference specific sources in my blog posts? What will appear on my credit card bill? Will the content be emailed to me as a Microsoft Word file? Will the material be 100% original and unique? Do you research the subject before writing? Will the content include any references? Are your payments secure? How do I pay for the order? Do you store any financial information about me? Who exactly are your blogs writers? Who owns the rights to the content you produce? Can you do other SEO writing, other than blog posts? Articles, etc. How does blog post writing works? Can you add other content to the text post? E.g. video, images, sound? Do you provide blog management services? Do I always have to pay in advance? How would a ghost blogger know what exactly do I want? BlogsWriters.com is the network of experienced blogspot writers who are fully versed to fill your blog with fresh and original content on the regular basis. We can prepare individual posts, series of posts or do complete blog management – from keyword research to advanced SEO. Let us know what you need, provide your writing instructions, topic, required volume, and we will do our best to help you! Although BlogsWriters.com is not a SEO company, we understand SEO and the importance of keywords for high quality web content. Our blog post writers will provide you with the keyword-rich content and give your blog posts effective titles. Also, for greater exposure and buzz, they can write in a way that provokes readers to leave comments and react on a given topic, which means more free content for every blog post. Yes we can. With very few exceptions our blog article writers can prepare posts of any length, on any subject, aimed at your target audience. In the rare case that we are unable to complete your order, we will let you know right away. On rare occasions, an unforeseen circumstance (such as unavailable sources) may cause us to turn down an order, so you have the opportunity to explore other options. We refuse to take your money if we cannot meet your needs: if our work is not going to be excellent, we are not going to undertake it! Our freelance blog writers have written for a variety of venues on hundreds of topics and all of them have a love for writing and experience in conveying their thoughts and ideas in a clear and enjoyable manner. Some write on any subject, but most specialize in certain areas they are the most interested in. Whatever your blogging needs are, we employ a broad selection of writing talents to match your blog’s topic and interests – so you can be sure that your blog is written by a knowledgeable, talented, reliable and motivated person. 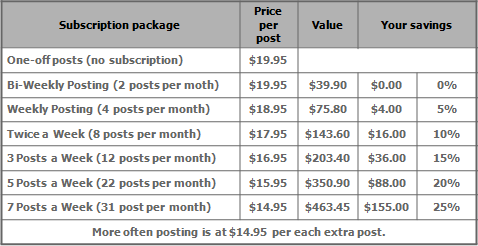 What are your blog writing rates? While blogging will not double your traffic or sales overnight, the long-term value of each blog post can equal thousands of dollars in revenues, media exposure and instant traffic. Thus, every dollar that you put into blogging is money that keeps on earning. And yet you pay peanuts compared to the advertising budgets for pay-per-click or offline marketing. Yes, we can prepare posts for your blog based on the sources you specify. If these are online sources, please let us know the URLs, if these are offline sources, please send us the scanned sources. For you this means we can write reviews on events, products, books etc. The charge will appear as PAYPAL *BLOGSWRITERSCOM or PAYPAL *BLOGSWRT. Please note, that the date on your credit card bill may be later, than the date when you placed your order. This may be a result of the credit card company internal procedures and is normal. Please fill out our order form. If you have special requirements, please let us know and we will give you a quote and issue an invoice. The invoice is payable via PayPal. We will email the content to you. We do not send any hard copies. If you lose your file, let us know and we will email it to you again. All blog posts are emailed in .rtf (rich text format). All popular word processors, including any version of Microsoft Word can read this format. Yes. We guarantee that the content you get will meet the requirements that you provided in your order and the quality standards advertised on our website. In the unlikely event that your order does not correspond to your requirements we will revise it at no additional charge. Please note that your complete instructions must be specified before we commence the writing. If your requirements change after we began writing, please notify us immediately, and we will see what can be done. If you are still not sure – you can try our service risk-free by placing your order for one single post! If you’ll find that our blogspot writing don’t deliver or you are not completely satisfied for any reason – you won’t be left holding the bag. We will return your money back, so you have nothing to loose! Yes, all blog posts are written from scratch just for you according to your instructions. We are very careful with admitting blog writers in our team and make sure all of them are professionals. Every blog post is written from scratch preceded by any necessary research. Yes. We understand that when you place your order – you expect good content, which would represent you online. Some of our writers take up just about any order, so they do a thorough research and learn enough to have something to say on the topic you requested, which results in original writing. Most of our writers, however, prefer to stick to certain topics that they like the most, so they know what they are writing about. Of course, they will do any additional research necessary to prepare a high quality blog post. Yes. If common sense tells us that we need to include certain sources, we will do so. We will also do so if you request us to. We prepare your content at a rate of approximately 1-3 blog posts per day. Please understand, that quality research and writing take time. In the unlikely event that we need more time to complete your large order, we will notify you immediately. All payments are processed by PayPal – one of the most popular and secure online payment systems. PayPal allows you to pay with your credit card or your PayPal account (you can easily open one upon checkout). We only receive and store your name and email address – all other information is handled by PayPal. All blog posts that we prepare are written from scratch according to your instructions. Therefore, we issue a refund only when the material does not conform the instructions you provided when you placed your order, is of lower quality than advertised on our website and we are unable to revise the work so that it matches up the agreement. Request for a revision or a refund must be received within two days after delivery. When a refund is issued, you have to agree in writing that you will not use the articles for which you have received the refund and that you delete all related files. Otherwise all sales are final. Our people come from various backgrounds and have different amount of previous training. Some are just part-time blogspot writers, others do this full-time. Passion for writing is what our writers have in common. We have strict selection criteria when hiring blog writers to our team – so you can be sure that your order is written by a knowledgeable, talented, reliable and motivated person. In fact, most of the material on this website is prepared by our writers, so take a look and see for yourself! You do. The blog posts you buy are exclusively yours. We will not use them in any manner. We encourage you to put a copyright notice on your blog and monitor the web to see if anyone uses your content without your consent. (You can use www.copyscape.com to do this) Usually, it is possible to get the violator to remove your original content from their website. Can you do other SEO writing, other than blog posts? Articles, marketing messages, sales copies etc. Although we specialize on blogs writing, if you particularly like the posts prepared by a certain writer or you’d like all your content (e.g. ‘about’ page, sales copy etc.) be prepared by the same team, please let us know your needs and we will see how we can help you. Once you place your order and specify your instructions, we examine carefully your topic and find the best match for your blogs writing needs. After a writer is assigned, he or she begins writing. Once your order is complete, it will be emailed to you. It is possible, that we may contact you via email for any clarifications and additional instructions. If you have additional instructions to the writer, please inform us as soon as possible. Yes, we can enrich your posts with licensed stock images upon your request. Please, let us know your needs, or specify this in the order form. The fee is $4.00 for each image. We choose a relevant alt text and a filename for your image. We do not provide videos, sounds etc. Currently, we do not provide any blog management services, but we plan to expand our offering in the next year. We will notify you of new services available, if you subscribed to our mini-course. Yes. Our writer can start working only after we receive your payment. A blog is a type of website (or a part of website) that has regular publications (posts) of commentary. Typical characteristics of a blog are its conversational style and regularity of updates (more often then daily, sometimes). Blogging, therefore, is preparing posts for the blog and maintaining it. Blogging is popular because it makes easy for anyone to publish online, provides environment for relatively short and regular publications, commenting. It fosters conversations and helps building communities. Blogging is also important to improving online presence because blogging means original content added often – what readers (and search engines) highly value. That is why Google favors the blogs so much and willing to help you rank well as long as you provide fresh content on a regular basis! Ghost blogging is like ghost writing – it is writing for hire, when the writer does not get any credit for the work and all rights belong to the ordering person. Ghost blogging is a great way for blog owners to have their blog updated as often as they like without spending the time for writing, or even without having the talent for writing. For ghost bloggers, on the other hand, it is an excellent opportunity to monetize on doing what they enjoy and to write on subjects they would possibly never write on their personal blogs. Ghost blogging is a profession, so we pay special attention to understanding your needs. We ask you to specify your instructions and let us know your website address, so we can see your style. We will ask you additional questions if we need more detailed instructions. When you receive your completed order, we ask you to review it and let us know if anything needs to be improved. Clear communication is the key to our success. If you want your posts to be prepared by a certain writer that wrote for you before, please let us know so.